You are here: Home / Home Design / No Way I Was Using Marble in the Kitchen! 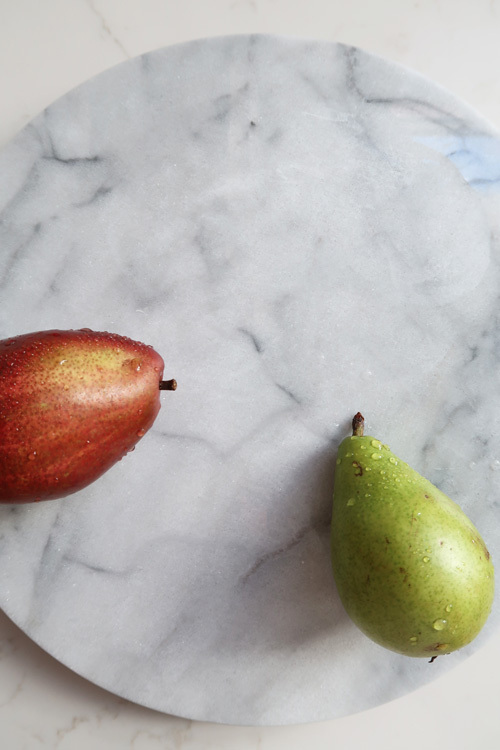 Are you trying to decide if you want to take the chance on marble counters in your kitchen? Why I avoided marble for my recent kitchen update and boy am I glad I did! Quartz, marble or granite counters are a beautiful addition to any kitchen. Each type of counter has its pros and cons on why you should or shouldn’t choose one over the other. Here I am going to share with you why there was NO WAY I was going to use marble in my kitchen, because of an inexpensive simple test. That test convinced me quartz not marble counters were the best option to replace granite. So you can see the original granite counters, here is a picture of my kitchen. This is Santa Cecilia granite and it’s lived in my kitchen for 8 years, with NO issues. Granite really is a phenomenal surface that can handle a lot of wear and tear. I would regular place hot pots and pans on the counter and it’s never had any damage. Why did I want to update my counters? My kitchen, as you can see from this picture, is dark. I don’t get a lot of natural light and the dark counter was absorbing even more of it! Plus the surface was busy with a lot of pattern. I wanted a calmer and whiter counter to anchor my kitchen. You can see I placed other objects to make it appear lighter and more white LOL. First of all, many people I know have horror stories or just general regret after installing marble in their kitchens. That made me take a serious look at why and what makes them upset? Marble etches (dull spots develop), stains, and is porous so it absorbs oil and grease – even from your hands. 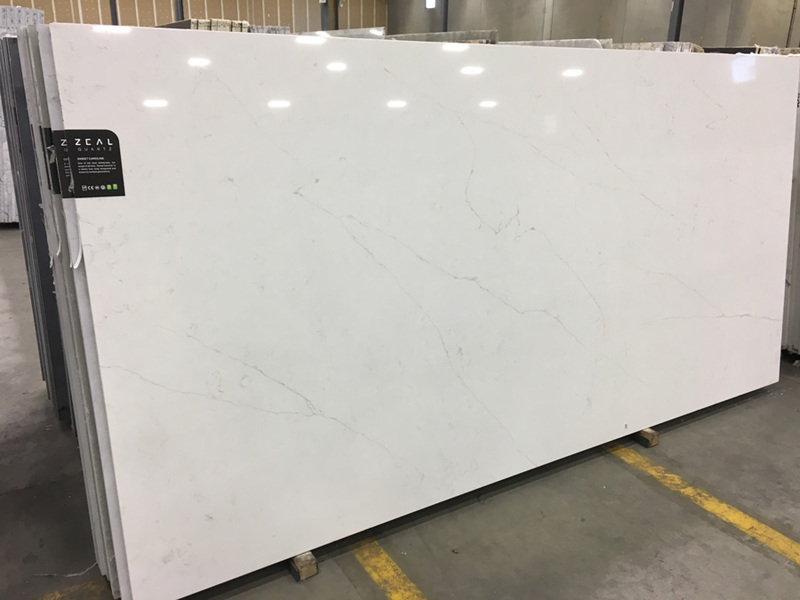 After searching slab yard, after slab yard, and finding gorgeous marble inspiration I decided to see if I could live with marble in the kitchen. Plus it was a good $15 to $20 cheaper a sq. ft. than quartz. Guess what? All of these things had the potential to etch or stain marble. Yikes! Normal day-to-day kitchen activity. So I bought a marble lazy susan for $16.99. This is what the marble looks like after the test. Yikes. 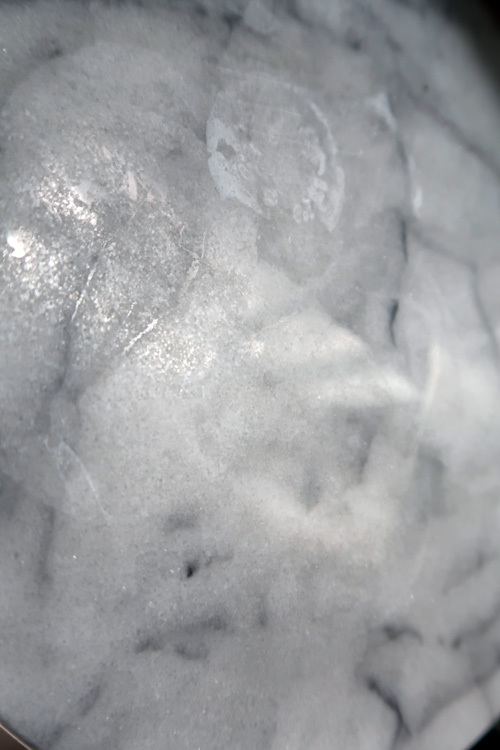 This picture was taken across the surface to better show you how etched the marble got, with just a little bit of use! Etching creates dull spots and even one so obvious you see a round lemon mark! Looking down on top of the board it isn’t so obvious, but most of the time you look across a kitchen counter. After this test, there is NO WAY I am using marble for my kitchen counters. I don’t want to have to constantly “be careful” or have to watch what my family or friends were doing on the counter. Now that you know I didn’t go with marble you know I went with quartz! It’s been the best money I’ve ever spent! The quartz counters have already weathered the major cooking holiday of Christmas, family visiting, and my son home from college for a month (he’s a slob). After visiting 3 slab yards and looking at countless samples, I landed on Zeal Sweet Caroline Quartz! 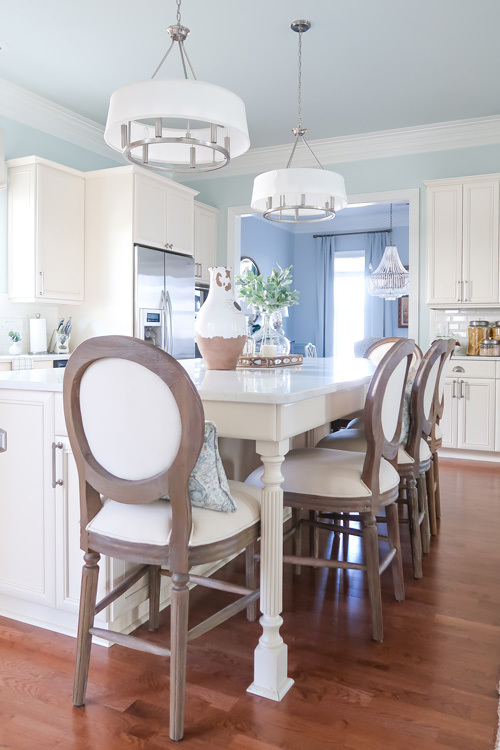 My cabinets are a very creamy white, so I needed a finish that wasn’t bright white. You can see it has a very natural vein pattern to it, which was my goal. Plus it coordinated really well with the cabinets. Literally, this is the slab on the island! I HIGHLY recommend choosing your slab at the yard. Even though they are man made, each quartz slab varies a bit. Long term, I plan to paint the cabinets a white that matches the backsplash tile to brighten up the entire kitchen. So for now, this counter bridges the gap between the cabinet and tile beautifully! There are people who do place hot pots and pans on their quartz, but if you read your manufacturer’s warranty it likely will void the warranty. Instead of worrying about damaging or yellowing the surface with heat, I bought inexpensive silicone trivets and have them in the cabinet in the island and in the drawer by my oven. One will always be readily available and easy to grab quickly! As part of the counter update, I also had to select a new sink and faucet. If you have ever had to weed through that process, it’s daunting! What was important in a sink was a deep double bowl and for the faucet clean lines and a pull down sprayer. 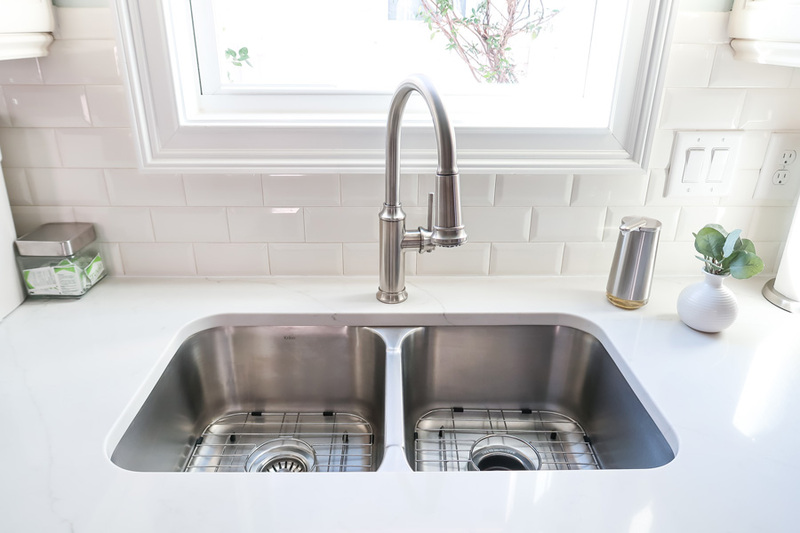 The Kraus double bowl sink was the PERFECT option (plus affordable) and is very quiet and deeper than my previous sink. The Blanco Empressa Faucet in Stainless Steel is the perfect blend of form and function being more transitional than traditional. The pull down sprayer is amazing and has a smooth retraction! Yay! The last one was always a battle. 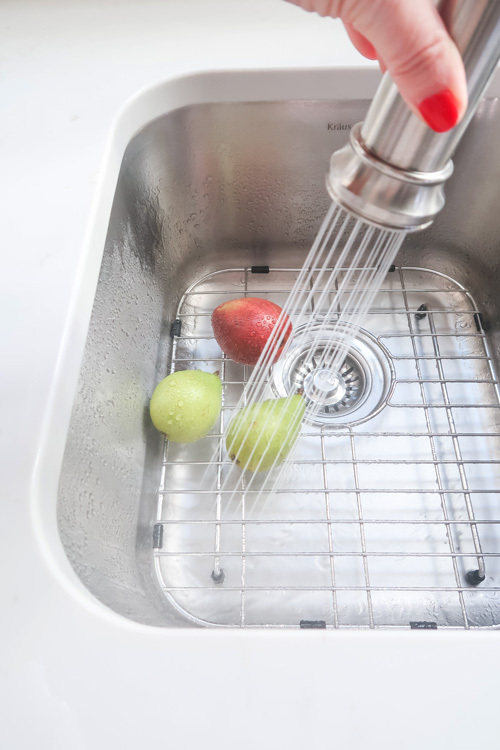 Plus the water pressure is much higher for better cleaning results. The sink came with grates on both sides, which has been a nice addition to protect the sink and for better drainage when washing things. Now for the full reveal! Literally, it feels like sunshine came into the kitchen when the new counters were installed. Going from brown granite to a white quartz reflected versus absorbed the light! 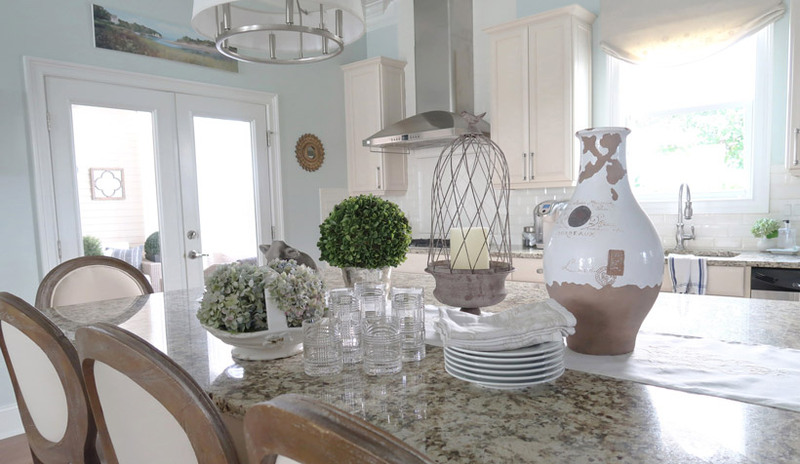 Sweet Caroline quartz is the perfect match in the rest of the downstairs, which is truly open concept! 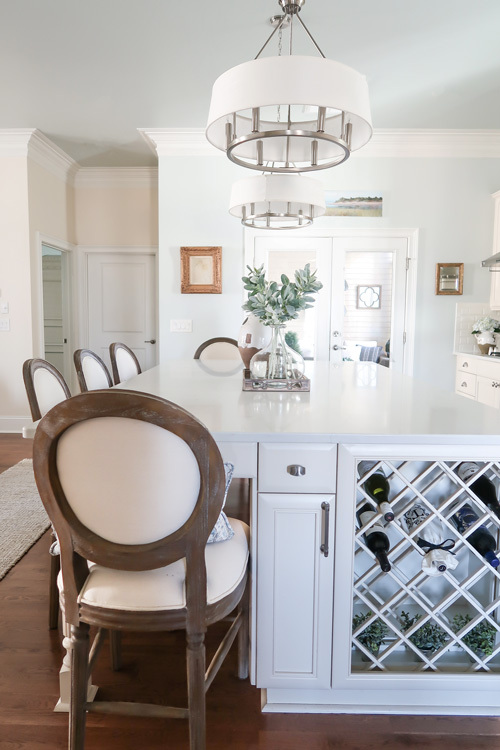 It coordinates with all of the other elements and colors in the family and dining rooms. 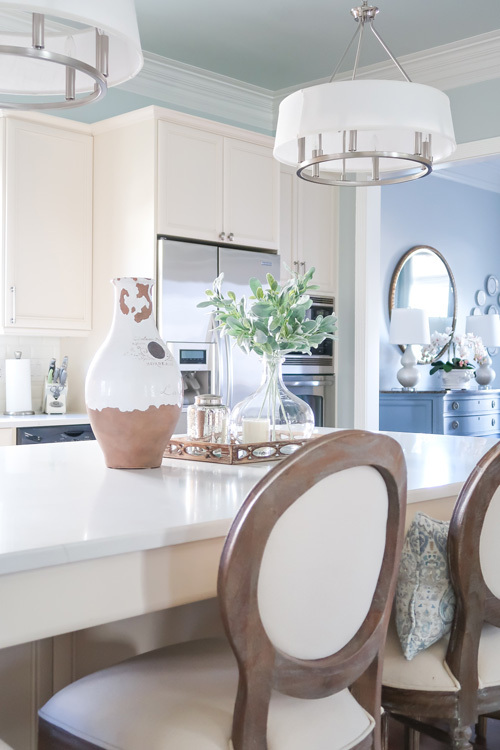 You can see how creamy the paint is on my island and cabinets, in this picture. 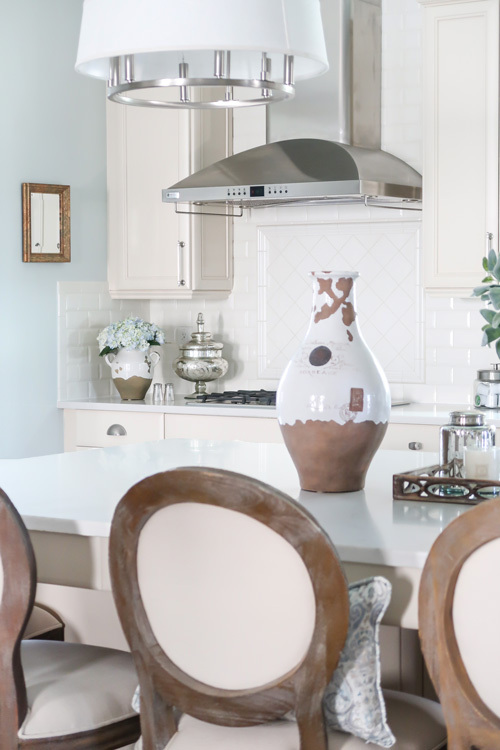 Updating the white paint color on the cabinets will give the final look I’ve been craving! Here is a closer look at the marble-like veining on the kitchen island. So natural looking! Even the installers said it was one of the best quartz designs they’ve seen. 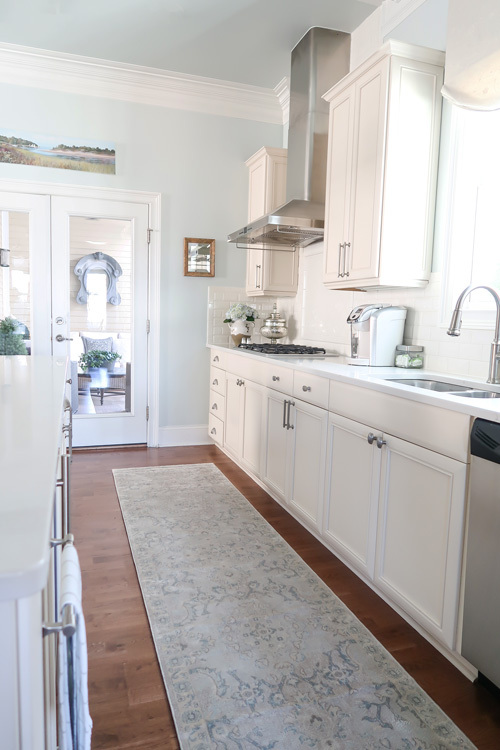 Everything looks so fresh and clean with the new quartz counters! If you were wondering, I have a gas cooktop that is in perfect condition so I reused it. Plus I was so impressed that the fabricator was able to remove the original granite, without damaging the current tile backsplash! By the way, the new runner is so soft and has the most beautiful colors plus it was SO AFFORDABLE! If you are local to the Charlotte, NC area I highly recommend Cutting Edge Stone Works and if you need advice on what counters to choose A House by the Lake Interiors. Lisa was a great advisor and helped me navigate the many options and slab yards! Here is a darker corner, so the detail in the Sweet Caroline quartz shows a bit more. 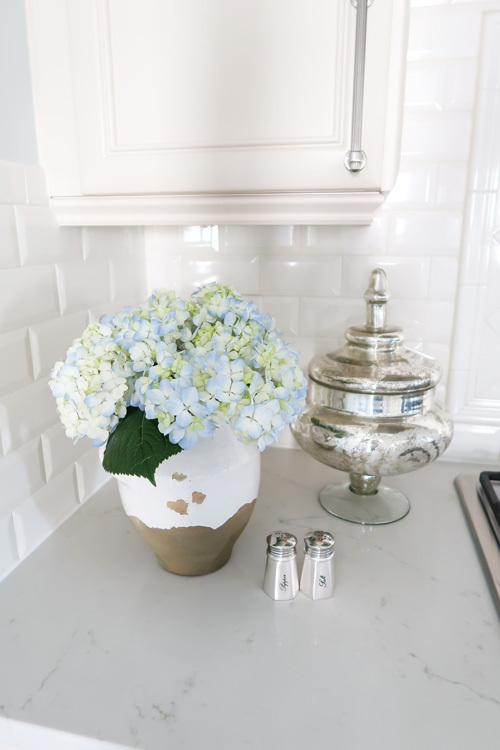 Loving the new salt and pepper shakers and vase with fresh hydrangeas on the beautiful white backdrop! The sunlight just bounces around the kitchen now making it all look new. I’ve been able to simplify the island and place just a few key items. Maybe your budget only allows for marble OR you just love the look and the patina that comes with age? Never one to leave you in the lurch, if you REALLY want marble counters in the kitchen there are ways to seal and maintain it! I’m considering using Shadow Storm Marble in my master bathroom renovation this spring. It’s been important to do my own research too! 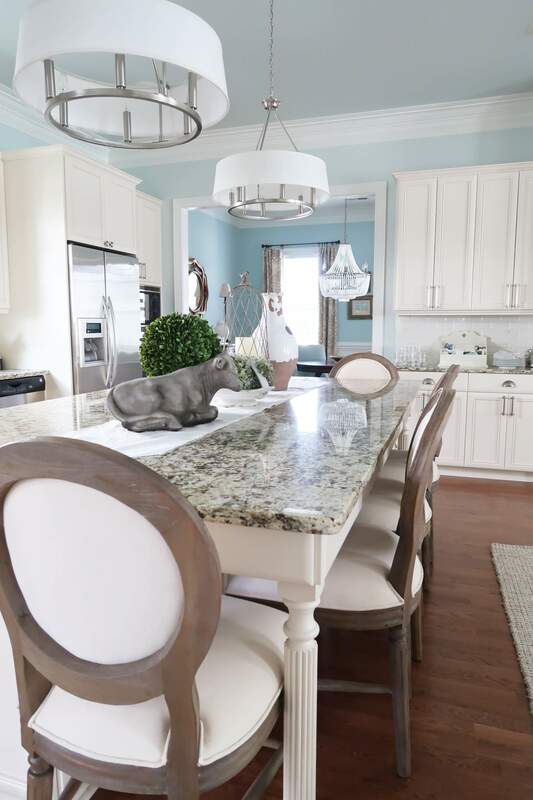 Another blogger chose marble for her kitchen counters and gives some really great advice. 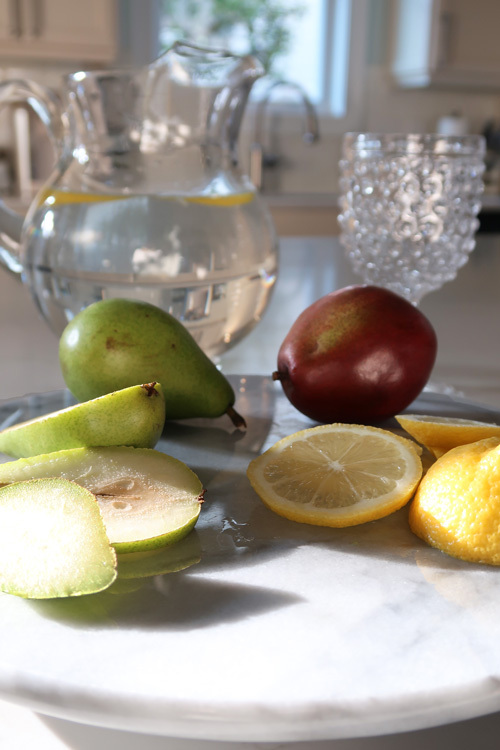 Try these decorating tips for a dark kitchen and see more pictures of my kitchen before! Good luck in your kitchen decorating or renovation adventures! Please consider signing up my weekly email so you don’t miss a post! It looks gorgeous! Your house is beautiful. Love the way you decorate! The end result is beautiful! You’ve sold me on the idea of quartz…next time! 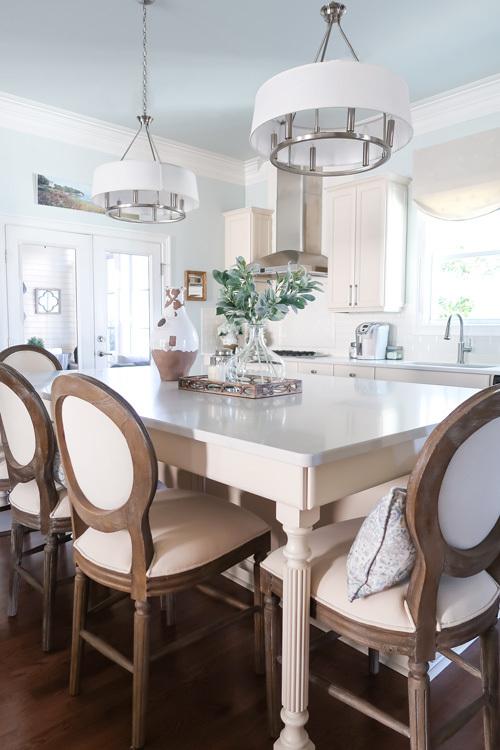 Tracey, As an avid cook and instructor for years, I’m amazed when people want to put marble in their kitchens for all the reasons you mentioned. When we remodeled our present home, I knew I wanted to stick with granite, but wanted a white look. 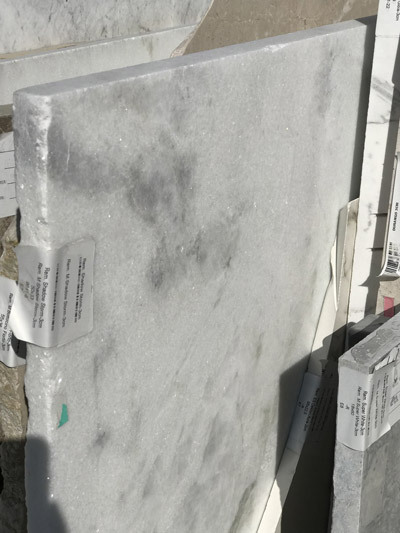 Fortunately, we found the most beautiful white with a bit of blue/grey veining granite. It actually has a specific name for it. 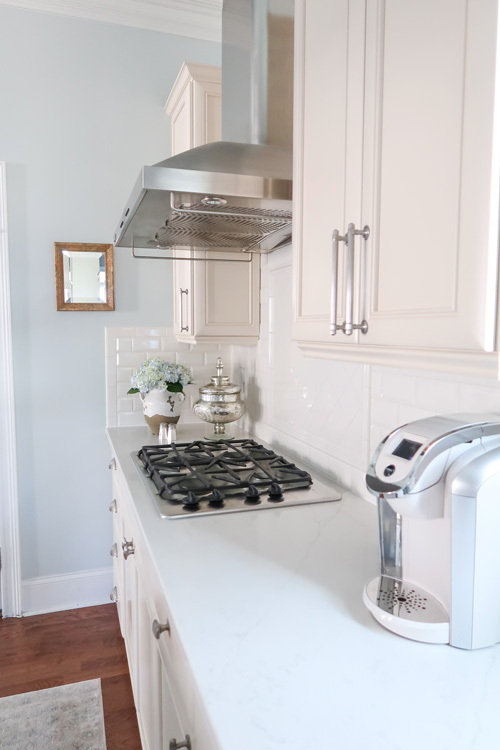 The white quartz you installed is gorgeous and it does make the kitchen look so much brighter. I’m sure your will love it for many years. Tracey this is awesome! What a great way of testing the marble! I’m soooo glad I went with quartz too. We have had several instances in the kitchen that I never thought would happen and then said to myself… Good thing we got quartz and not marble because this would be ruined. Your kitchen is stunning! How exciting!! 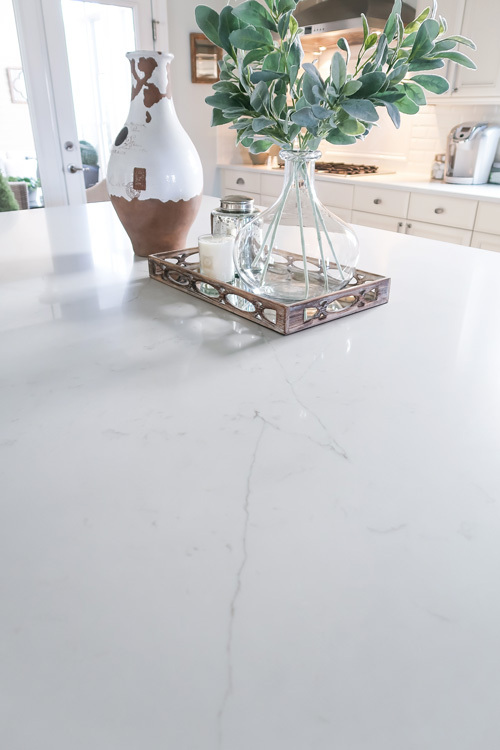 After much research I have quartz in the kitchen – love it and no regrets!! Julie! Glad to hear it 🙂 Best money I’ve ever spent! 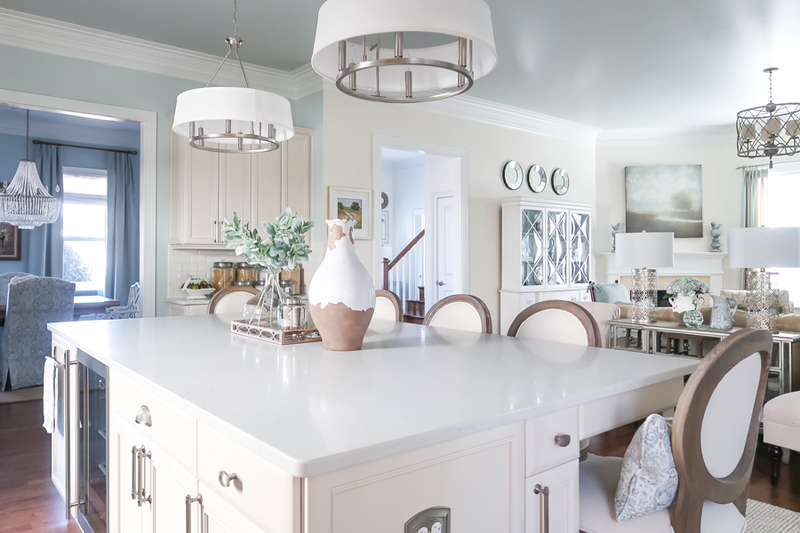 The white makes the kitchen calmer, fresh, and it feels cleaner which makes me happier too.